Orange’s Maia Kaufman (5) breaks away from Liberty’s Caitlin Curmode and Gia Gaetano (12) during the first half of Thursday’s OCC-Buckeye showdown in Lewis Center. Olentangy Berlin – check. Olentangy Liberty – check. 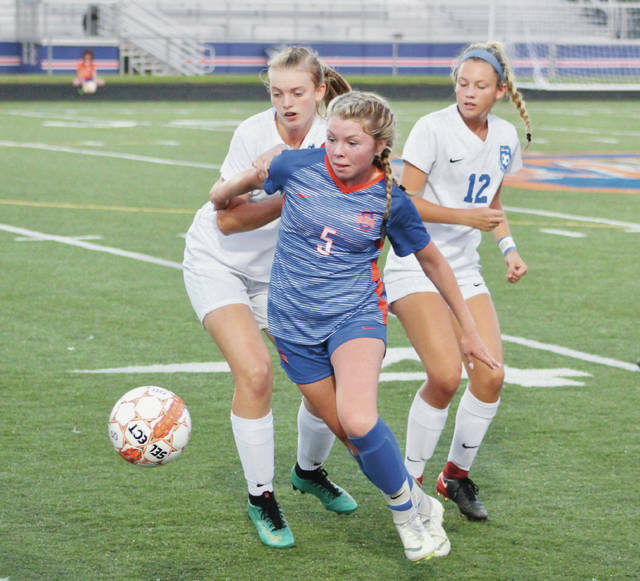 The Olentangy Orange girls soccer team is two-thirds of the way to reaching one if its goals and one-fifth of the way to reaching another thanks to a 2-0 win over rival Liberty to open OCC-Buckeye play Thursday night in Lewis Center. The stakes were high when the Patriots and the Pioneers played last year. Orange beat Liberty 2-1 in Powell early in the conference season, which helped the Pioneers capture a league title. Liberty returned the favor, beating Orange 3-1 at Dublin Jerome to capture its fourth straight district title on its way to a second state final four in three years. Aurelia Johnson beat the goalie high on a free kick a little less than 10 minutes into the game to put the Pioneers (2-3-1, 1-0) on the board. They made it stand, holding Liberty without a shot on goal in the first half. Meanwhile, Orange had a flurry of near misses toward the end of the half. Samantha Fedio freed up Maia Kaufman with a pass through the middle of the defense in the 34th minute, but the shot rolled wide right. Grace Poorbaugh sent a shot wide left on the next possession and Liberty defender Lyndsey Kijowski stepped in front of a Camryn Earl centering pass and cleared it to keep the Patriots close through the break. Liberty only managed one shot on goal and it came in the second half. Emma Lindsay found space in the middle, but her shot was saved with relative ease by Orange goalkeeper Amanda Poorbaugh, who took over for Linnea Milner at the start of the second half. Orange almost added to its lead in the 63rd minute. Shazia Waggoner centered from the left to Johnson, but her shot missed wide. Weidenhamer finally got a shot to go, sending a shot in off a Morgan Scott centering feed with 3:43 left. The Pioneers almost added another on their next possession. Kaufman broke through the Liberty defense and missed just right. Riley Cartwright finished with four saves in goal for the Patriots (2-4-2, 0-1), who played their first game since Sep. 4. Liberty is back in action Saturday against Lakota East in non-league play. The teams will kick off at 3 p.m. in Powell. Orange is off until Tuesday when it travels to New Albany in non-league play.